As students of the essentially practical subject of maritime archaeology and also as commercially qualified divers, the opportunity to work on a professional project came as a welcome prospect. As a result of the planned Nord Stream gas pipeline running through the Baltic Sea, transporting gas from Russia to Germany, an archaeological survey of the Bay of Greifswald, where the pipeline comes to shore, was conducted. Along with this area of the coast and a large area of the Baltic Sea, the pipeline project also concerns a large area on land within Germany. The archaeological investigations were carried out by Bureau for Culture and Care and Preservation of Ancient Monuments and Artefacts (LKD M-V) in the state of Mecklenburg-Western Pomerania and the objects under examination were anomalies from a series of side scan surveys that were conducted during the earlier stages of pipeline planning. From October to December 2008 students of the Maritime Archaeology Program at SDU Esbjerg too the chance to experience at first hand the nature of the work in which they were training for. The work was performed from the Danish boat “Havgus” and the international archaeological team was comprised of divers from Germany, Ireland, and Norway. By night the boat was docked in a small village called Lauderback on the scenic island of Rügen. The work was assigned to be carried out every day for 12 days with a 4 day break continued with a further 12 days work and so on, but the weather in the Baltic is rather unpredictable in November/December, so diving was not possible everyday. The team numbered 6-7 divers on the boat, and for every dive there was a diver, one rescue standby diver and one tender. The searches were on completed at various depths, ranging from 3 to 20 meters. The objective of the diving survey was to assess whether the anomalies were of an archaeological nature. In the case of a site being recognised as being archaeologically significant they were to be reported for further archaeological work. 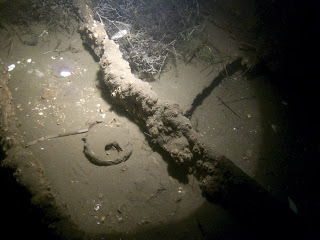 During the diver survey sites were described, recorded and, in certain cases, further suggestions were made for archaeological investigations and actions. During the project there were typically three main site types most found, natural features, single archaeological items and major archaeological sites. An example of natural features would be turf banks or tree trunks. Turf banks were measured, described and investigated for specific features, whereas tree trunks were sampled and tested for dendrochronological analysis. Single archaeological items, for example anchors, were assessed by divers for preliminary documentation and such items were to be recovered sooner or later. Major archaeological sites had to be assessed for further archaeological documentation and rescue. An example of such a site was from a ship barrier measuring 980m long and located at the shallow mouth of the Bay of Greifswald dating from 1512 and the Great Northern War. The Swedish Navy sank 20 ships to create a barrier to safeguard their control of the area. The pipeline will run trough the middle of the barrier and so one of the ships will require excavation. Prior to this however a survey was carried out which included measuring and detailed recording sketches, photographic and video documentation of the ship remains. The plan for the wreck is to excavate it in the spring of 2009 and redeposit it in a freshwater lake for further preservation. The students of the Maritime Archaeology Program at SDU wish to sincerely thank the Bureau for Culture and Care and Preservation of Ancient Monuments and Artefacts and particularly Mike Belasus for giving us the opportunity to work on a professional archaeological project of such high standards and believe the their experiences will aid to further their careers in the area of maritime archaeology.